Tip: Keep an eye on the lamb in the oven, the aim is to for the lamb to be so tender and succulent that it falls off the bone. It may help if left to bake a little longer. Welcome along everyone, we’ve got an incredible recipe that’s packed full of flavour for you to try at home – Baked Herby Lamb Shoulder with Bubble & Squeak and Mint Sauce. 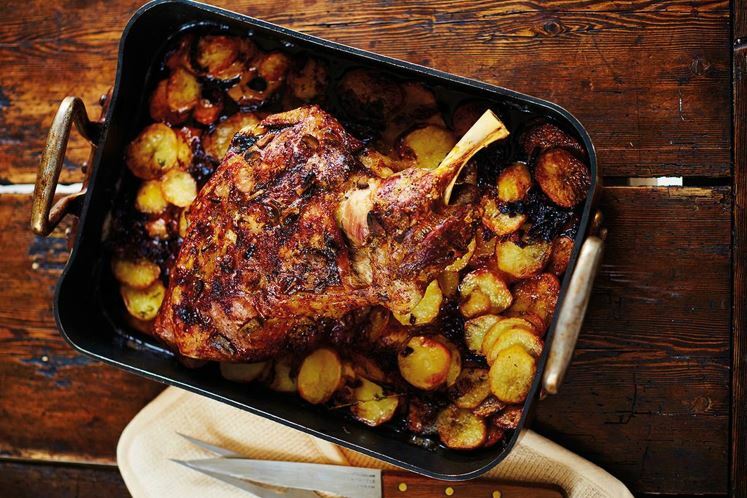 You’ll be blown away at how fantastic the lamb tastes after being slowly cooked in the oven. We’re pairing it with a beautiful side of bubble and squeak and a homemade mint sauce that’s to die for! Our team at the Sauce Room are sauce specialists and have put some steps below so you can have a go at making your own mint sauce. The recipe is easy to follow and all you need is a nice baking tray and some fresh ingredients…..
For the lamb, mix together the butter, tarragon, mint, parsley, garlic and salt and pepper to taste. Spread it all over the lamb, season well, then lay the lamb on the tray. Add the carrot, onion, fennel and rosemary. Cover with a layer of aluminium foil and roast for 1 hour. For the bubble and squeak, rub the potatoes with the oil and put them on a baking tray. Bake for 1 hour, or until the cooked. Reduce the oven to 160C/140C Fan/Gas 3, remove the foil and roast the lamb for a further hour; it should almost fall off the bone. Transfer it to a platter to rest. Pour the stock into the roasting tray and bring to boil on the hob. Strain through a fine sieve into a saucepan, then skim off any fat using a spoon and keep warm. For the mint jelly, put the sugar, apple juice and vinegar in a saucepan over a low heat until the sugar has dissolved. Turn up the heat and bring nearly to the boil. Set aside to cool. Add the shallot, mint and plenty of salt and pepper to the apple juice mixture, cover and refrigerate. For the bubble and squeak, boil the swede in salted water until tender, then drain well. Blanch the cabbage in boiling salted water, refresh under cold water, then drain well. Melt the butter in a large frying pan over a medium heat, and sauté the shallots, garlic and thyme until lightly coloured. Add the cabbage and cook for 2 more minutes. Scoop the potato flesh out of the skins into a bowl. Add the swede, then mash together, retaining some texture. Add this and the parsley to the cabbage mixture, season and mix well. Cook for 1-2 minutes, stirring from time to time. Serve the lamb with the bubble and squeak, gravy and mint sauce. Good luck with the recipe we hope you like it! If there’s anything you want our chefs to prepare don’t be shy, they love a good challenge! Why not get in touch and let them create something special for you.